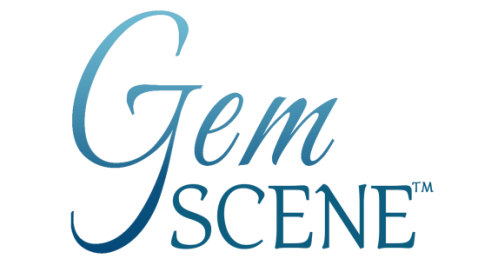 Responsibly sourced and faceted gemstones from Columbia Gem House. "Consumers are really tuning in to the idea of “green” jewelry." 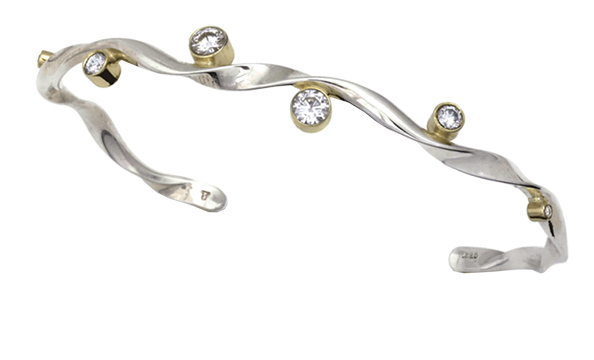 Fairmined silver and gold bracelet set with recycled or lab-grown diamonds, designed by Martin Taber for EthAus Jewelry. With the tragic death of Campbell Bridges, the world lost not only a very eminent geologist, gemologist and ethical miner, but also an committed environmentalist and humanist. 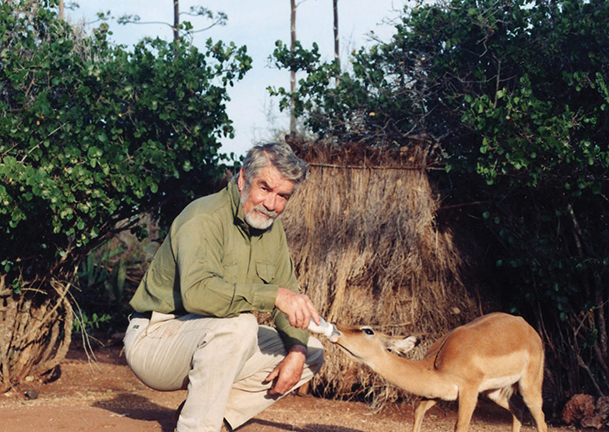 Shown here in happier days, Bridges feeds an orphaned impala that he adopted and named Friday. 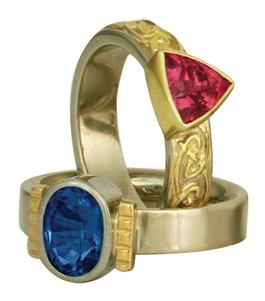 Gemstone and gold rings and earrings designed by Reema Keswani/Golconda. Elke Berr, back row, second to left, poses with children at an orphanage she helps support in Mogok, Myanmar, during one of her gem-buying trips. Lorenz Baumer, back row, center, with students in Sumba, Indonesia. 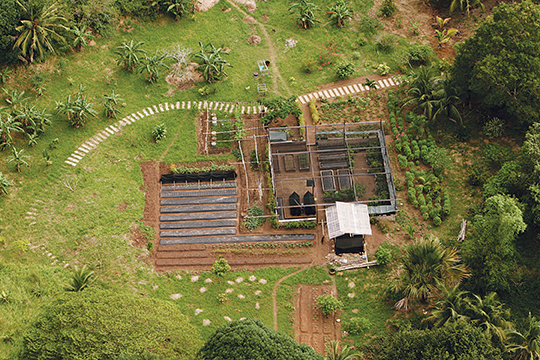 A model organic farm established by Jewelmer's SPSF to teach sustainable farming to inhabitants of Palawan in the Philippines. For more on eco-friendly gems, jewelry and fashion, click on Magnifeco and Eco-Trends. ​ Today, consumers are increasingly concerned about understanding the environmental and social impact of the products they buy—from clothing to footwear, from food to beverages, and, yes, from gemstones and precious metals to finished jewelry. Retailers, jewelry designers and brands are making ethically-mined gemstones, diamonds and precious metals the centerpiece of their business. These initiatives are part of their brand identity and an important part of their marketing efforts to consumers. These ethical and corporate social responsibility (CSR) practices go beyond mining and cutting to also include social outreach programs, environmental conservation and infrastructure projects in mining areas around the world. Eric Braunwart of Washington-based Columbia Gem House understands that is important to let consumers know the source of their gems and jewelry. 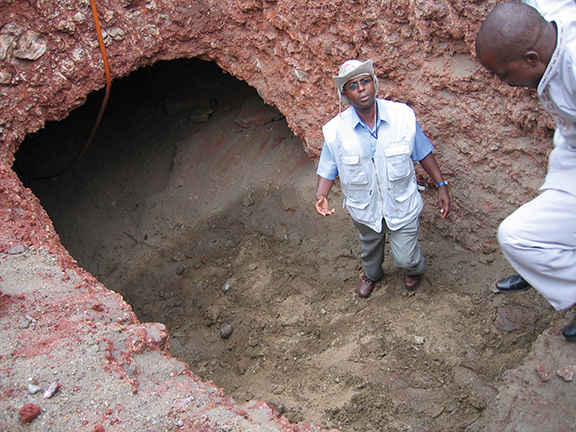 When he decided to partner in a mine in Malawi, Africa he recognized that “sharing the journey of a stone from mine to market” is part of their buying experience. 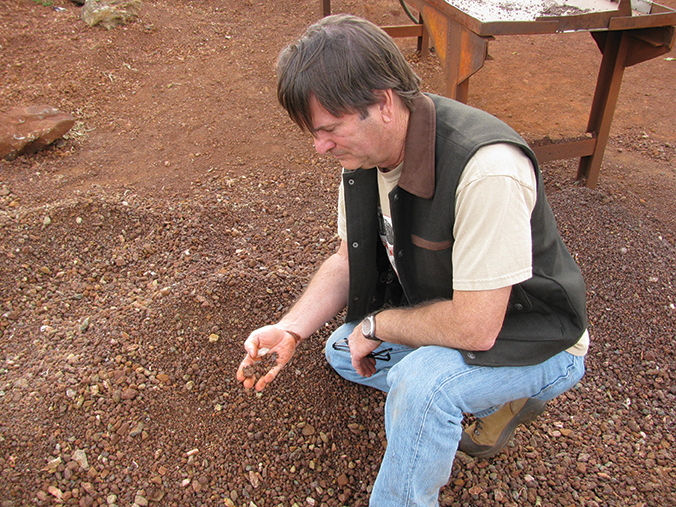 Bruce Bridges, of Arizona-based Bridges Tsavorite Inc., also says that the story behind the stone is very important. One of the unique aspects of this company is that it is fully integrated from mine to market. 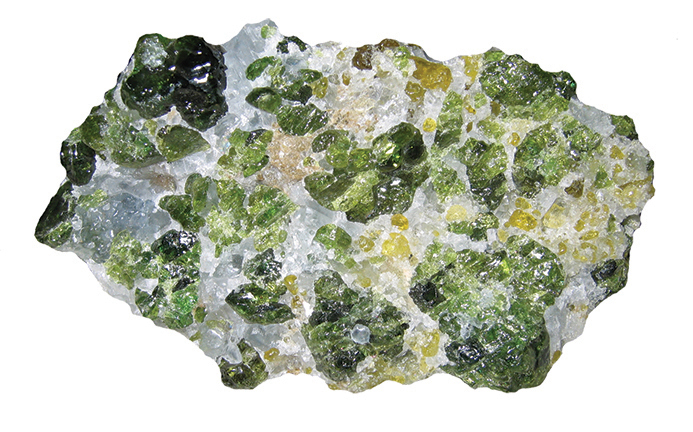 The tsavorite from their mines in Kenya is in their control from the time it leaves the earth, through washing and sorting, right up to the moment it is ready to sell as a faceted gemstone. This allows them 100 percent quality control and the ability to verify that their goods are mined legally, ethically and in an environmentally friendly manner. On a larger scale, UK-based Gemfields also maintains this type of control over its stones from around the world. 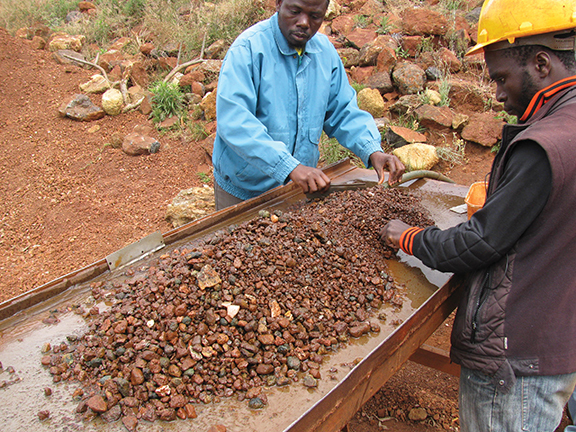 “Our approach is to set new benchmarks for environmental, social and safety practices in the colored gemstone sector. Recognizing our leadership role, we are working to support increased transparency across the wider downstream supply chain, thereby providing discerning customers with increased confidence in the responsible journey their gemstones have taken all the way from our mines,” says Ian Harebottle, Gemfields CEO. Colombia-based MUZO also controls every step its emeralds from the famed mine travel as they move up the supply chain. 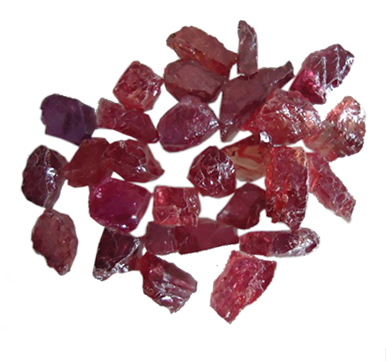 Knowing the sources of gemstones is important to retailers and designers who want to support and do business with them because they are committed to buying gems that are ethically sourced. Martin Taber, of California-based Taber Studios, explains, “I purchase sapphires exclusively through Columbia Gem House, where they are originally sourced from Montana gem fields.” Taber is also president of Ethical Metalsmiths, whose mission is to work directly with jewelers and metalsmiths to raise awareness of current sourcing issues and manufacturing practices, with the goal of improving the mining and jewelry industries. Reema Keswani, owner of New York gem dealer and custom designer, Golconda, makes ethical sourcing an integral part of her business. She travels the world to meet the smaller miners and get as close to the source as possible in order to assess labor conditions and practices. Meeting the demand for ethically sourced diamonds can be more challenging than for gemstones. 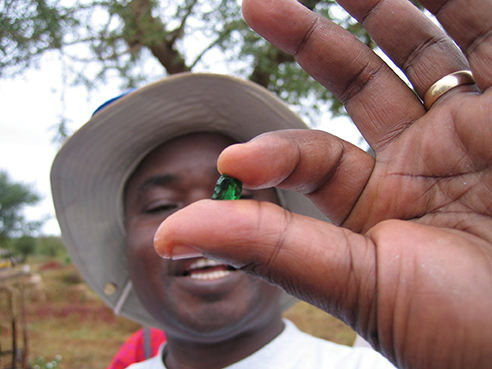 While approximately 80 percent of colored gem mining is carried out by small artisanal miners, which can allow for more transparency and the ability to adapt to changes, the diamond market—once controlled by DeBeers—has a history of non-transparency in pricing, issues of child labor, human rights violations and the funding of bloody civil wars in the production of the stones. To counter these issues, the international Kimberley Process Certification Scheme entered into force in 2003. It establishes the requirements for controlling rough diamond production and trade. While it has certainly helped to ensure “conflict-free” diamonds in the vast majority of cases, issues of non-compliance, smuggling and human rights abuses other issues still plague the industry. For some jewelers and designers looking for ways to ethically source diamonds, the answer is lab-grown. These cultured stones are exactly like their earth-mined counterparts, but are created in a laboratory. This sector has received a lot of attention recently from celebrities such as Leonardo DiCaprio (who starred in the film Blood Diamond), who has focused attention on California-based Diamond Foundry, for example. “We also offer customers cultured diamonds,” adds Taber, whose company is a member of Diamond Foundry’s master artisan and design program. Another growing trend is the use of recycled diamonds. He adds that the natural diamonds they use “are mostly recycled stones as this minimizes the impact on the environment because they have already been mined.” Among other designers who use recycled diamonds is California-based Tura Sugden. “We source recycled diamonds from vetted companies,” she explains. The way gemstones and diamonds are sourced is only one part of the bigger issue of how all natural resources are mined and distributed. Retailers and jewelry designers are also looking for ethically-mined precious metals such as gold and silver in order to create pieces that are as sustainable as possible. Choyt goes on to explain, “The gold amalgam is then heated, sometimes in frying pans that are then used for cooking!” The vaporized mercury, one of the most dangerous of all neurotoxins, is released into the environment leaving the gold in the pan. The mercury that is not inhaled in the burning process eventually ends up in the environment where it is eaten or absorbed by organisms and is converted to the highly toxic methyl mercury. While the Mad Hatter was a fictional character in Lewis Carroll’s Alice’s Adventures in Wonderland, the neurotoxic effects of occupational chronic mercury poisoning due to the felting process of hat making were not at all fictional. Nor are the consequential effects of mercury poisoning in the gold supply chain. While concerns with large-scale gold mining companies and their effect on the environment—they use mercury, cyanide and other chemicals—has been widely reported, we focus attention here on the artisanal cog in the supply chain. Increasingly, designers, retailers and brands are turning to groups such as Fair Trade Gold and Silver. This organization provides an avenue of distribution for small-scale miners by connecting them to ethically minded designers. They guarantee a certain standard on working conditions, child labor, women’s rights, clean technology, health, safety and organizational management with transparency and traceability in mining operations. Miners are guaranteed a certain market price and a premium of $2000 per kilogram of metal to invest in their businesses and communities. 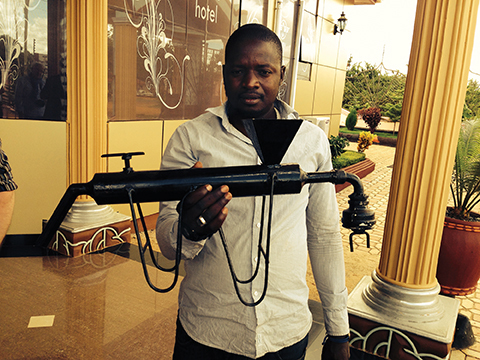 Transparency and ethics from mine to market are one aspect of doing business in a developing country. The other component is to create and support programs and provide services that have a positive impact, in other words, to practice Corporate Social Responsibility (CSR). To ensure that local residents felt they were being heard and had a say in decisions that affected them, Braunwart created a community group. By including everyone in the decision-making process, “they are also a part of finding solutions to problems that are sometimes cultural.” When he built a school, he got local residents involved when children didn’t want to attend. “To engage the boys, someone came up with the idea of getting twenty soccer balls. This made the boys want to come and play—and learn. The girls wanted clothes to wear to school. So we made uniforms for them.” And he built housing for the teachers who wanted to live near the school. There are different ways to have an impact on a community. 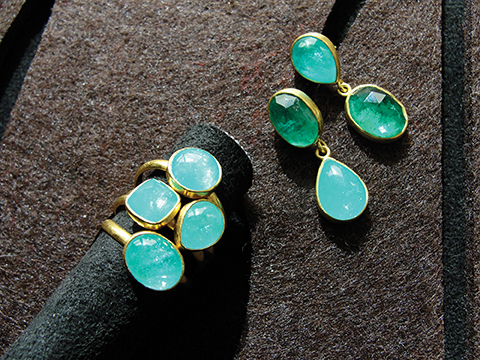 Campbell Bridges, Bruce’s father, created an entire industry in East Africa with his discovery of tsavorite in the late 1960s. “My father created an industry that didn’t exist before,” says Bruce Bridges. “He felt strongly about creating organizations like the Kenya Chamber of Mines, which was designed to help local miners have a stronger voice and be able to petition as one. And he also wrote standards for the industry such as the guide to artisanal mining.” Campbell Bridges gave full medical and liability insurance for his workers, which also helped create a standard for compensation. Other businesses, schools, and clinics were built as a direct result of starting this industry and helped improve the lives of many people. From his luxurious boutique on the Place Vendôme in Paris, French designer Lorenz Baumer, is very down to earth when it comes to helping out those less fortunate. A supporter of FXB International’s VillageFXB, which addresses poverty and malnutrition around the world, he also uses jewelry to benefit children’s education in Sumba, Indonesia. “I designed a collection of pendants inspired by traditional motifs that are crafted by people on the island who use ancient weaving techniques,” he explains. “The money from the sale of each of these bracelets pays for supplies for ten children to attend school for an entire year.” Last year, his project allowed 2000 children to go to school. “That is the most beautiful jewel of all,” he smiles. In the Philippines, the focus of Jewelmer has been on creating pearl farms to produce the highest quality golden pearls in the world. Along with their success, however, co-founders Jacques Branellec and Manuel Cojuangco looked to the next level, where environmental protection, sustainability, and social responsibility are vitally important. “While pollution, climate change, rising sea levels, and shore erosion are a threat to the global community,” says Branellec, “Jewelmer is also confronted with challenges on a micro level, problems with a direct bearing on the health of our oysters and hence our pearls.” The most destructive challenges are the illegal practices of sodium cyanide fishing and dynamite fishing, which have far-reaching negative consequences on the health of the sea. The unlawful technique of “slash and burn,” used in cultivating rice, results in desertification of the land and silt that enters the ocean upsetting the natural balance in the coastal ecosystem. Branellec and Cojuangco understood that simply prohibiting these practices would not work because for some (but not all) of these wrongdoers, it is a question of survival. The only durable answer to these problems is to change the prevailing mentality and behavior by offering other options. In 2006, they created “Save Palawan Seas Foundation (SPSF)” to provide conservation and management strategies to facilitate the long-term sustainable use of aquatic resources of the province of Palawan. Jewelmer also operates a free medical clinic for residents of the neighboring communities. According to Earthworks, some 115 jewelry brands, designers and retailers of all sizes and product type, support the its Golden Rules, a set of criteria for responsible mining.